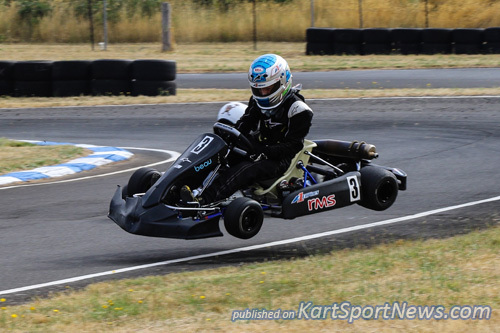 The AUSTRANS VCS Round 1 blasted off in 2017 with over 200 entries at Haddon Raceway in Ballarat. 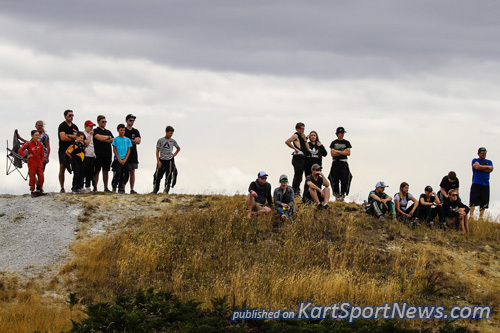 On the Saturday karters and pit crew had to contend with the heat of summer as the mercury pushed through the mid 30s, lots of rubber was going down making for some exciting viewing with the return of the MG yellow turning the track’s corners into black lines. 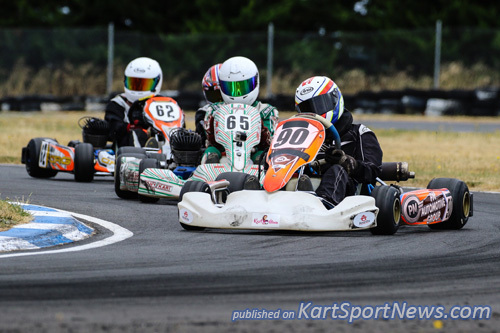 Race day was upon us as were the clouds – patchy at first with occasional breaks to let the sunlight beam down only to have the wind start to pick up and the cloud cover thicken. The wind became very strong in the lead up to the finals as drivers tried to be as low as possible going up the straight. 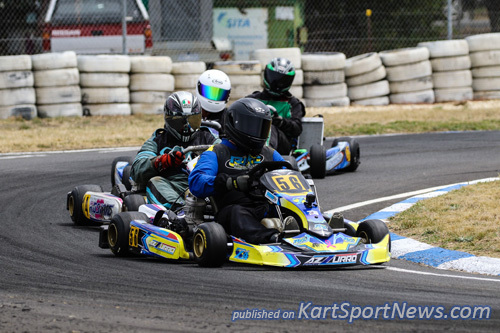 With Qualifying done the first heats were mostly uneventful as drivers got used to the new start light procedure. With the track at a high grip level spectators were treated to some great racing over the day and in the lead up to the finals however with only 4 classes completing their finals the heavens opened with a vengeance and the Cadet 9 class was literally blown off the track as they aquaplaned across the deep standing water. With no letup in sight and thunder and lightning getting very close, the stewards decided to be safe rather than sorry and cancelled the remaining finals and ended the meeting due to “force majeure”. 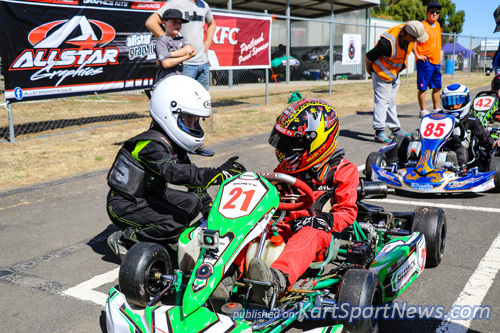 With even more sponsors on board this year the AUSTRANS Victorian Country Series is fast becoming one of the most popular and competitive series to race in. 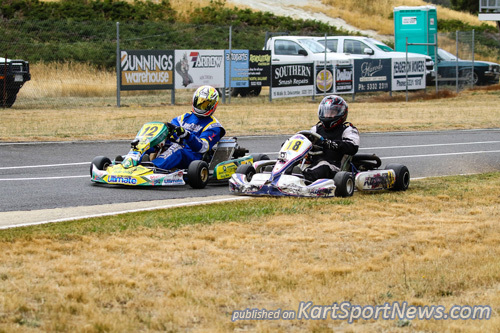 The next round will be at Cobden April 23rd South West Kart Club. Looking fast in practice Scott King continued this form all the way to claim victory with an almost unchallenged run in the brand new Corsa CH17. 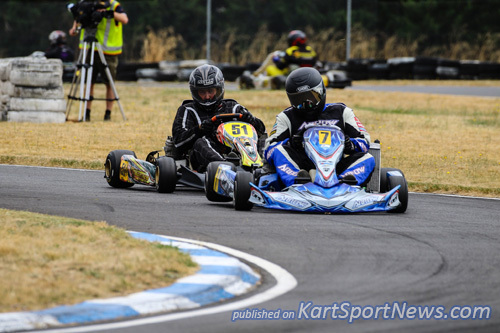 In the pre-final Adam King found some pace to run with Scott and gave it his all, managing a pass at turn 1 only to have Scott deny him the lead on exit, while the rest of the field diced for the minor placings. A spectacular accident ending in an almost soft roll over from McPherson to miss running straight up the rear of Vern Kranz who was already tangled with Andrew McNamara, karts were cleared quickly and after DNF`s by nearly half the field in the final Andrew Cash seemed to have something in the tank and stayed with Scott only to have the number 4 drive off into the distance and claim the overall points for the round. 2016 series winner Steve Malkin was out to take up where he left off but Andrew Stubbs had the pace early and claimed pole. Local identity John Page had major engine issues in qualifying and had to pull off the circuit,but shortly after bolted on a shiny new borrowed Rotax for the day. Race 1 went to Malkin with Stubbs and Hobbs in very close pursuit. Race 2 saw John Page use his knowledge to get the better of Stubbs and Malkin and set himself up for the final starting from pole. Malkin got a great start and headed the pair for a few laps until Stubbs made room for himself and passed Malkin on the kink before T1 as did Page 2 laps later. Now locked in a battle with Andrew Stubbs John Page brought out all the stops passed and drove away for a comfortable win in the end. 14 juniors were lined up to put on a show and a show they did with overtaking a plenty in this competitive class. 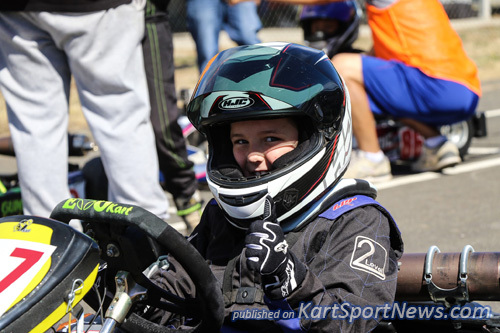 Max Owen with p1 started and finished the first heat and looked very strong. 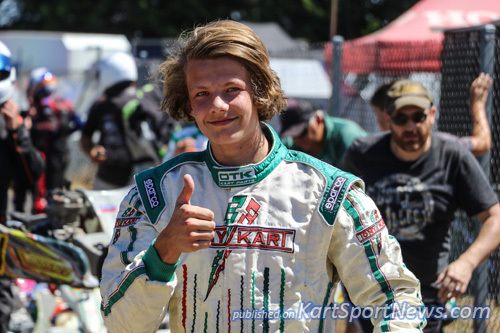 Ethan Church had really good pace to be able to take it up to Owen in the pre-final but out of a very close pack of 5 Tyler O`Leary emerged, and with speed and skill claimed the win. The final was again a nail biter with the same 5 trading positions throughout the 19 laps. Bettess had been around the mark and he had a crack to lead only to be passed by O`Leary and Amber Miller, Will Kelly-Merrifield made the most of an opportunity and improved his position late in the race which was retaken by Bettess. With 3 to Amber Miller had shadowed O`Leary beautifully and was looking to set him up for the last lap pounce but Ryan Bettess cleverly slotted his machine into 2nd forcing Miller to go on the attack which she did with 1 to go regained 2nd and finish there as O`Leary had cleared the pack enough to take a comfortable victory. A big field of TAG Lights rolled up with 17 to contest race 1, Jordan Rae took the pole and had an epic battle with Justin Francis in the first heat with Francis taking the win. 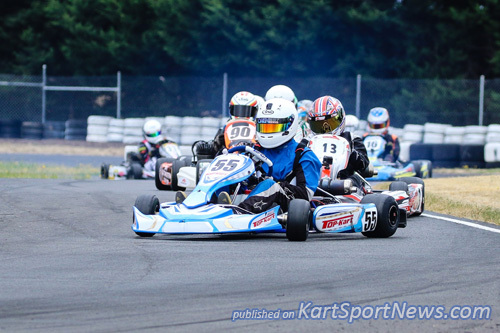 In the pre-final there was some extremely close racing and in time proved to be too close as Rae went from the lead to the rear and Francis being DSQ leaving Jordan Piannezzolla in 1st and Benjamin Delaney in 2nd to finish respectively in those positions. 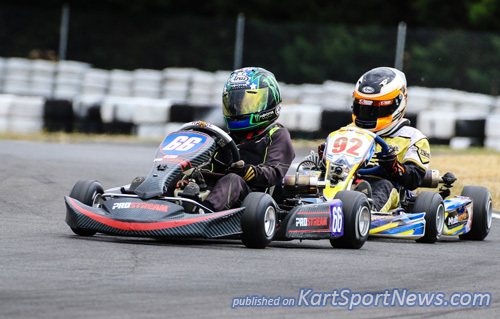 The final would see Jordan Rae starting further back in the pack along with Francis, Jacob Dowson showed he had speed enough to be a contender but was set on a roller coaster ride through canteen corner only to land and find the grass which made it difficult to return to the track and so lost several positions and would later call it a day with minor damage. Shortly after this incident the light brigade were the pioneers as it started to lightly spit with rain; just enough to wet the surface and to make hot slicks slide. 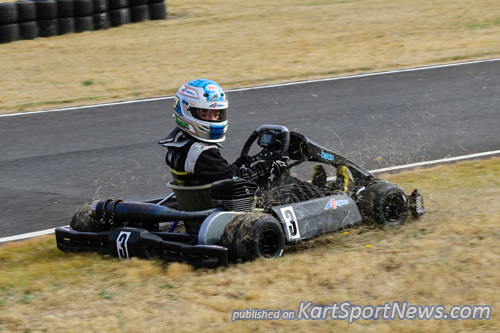 This was all Jordan Rae needed to slip through the field and take the lead in a class display of kart control. The very small shower a taste of what was to come wasn’t enough to stop a dry line appearing and being the first Jordan seized the moment and drove away with the win. 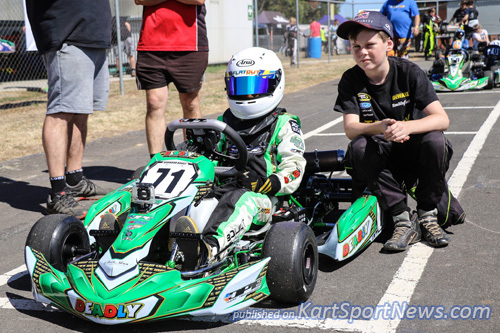 Ashley Lear had a shocker of a first heat, moving back to 15th after drama unfolded in front of him in turn 1. 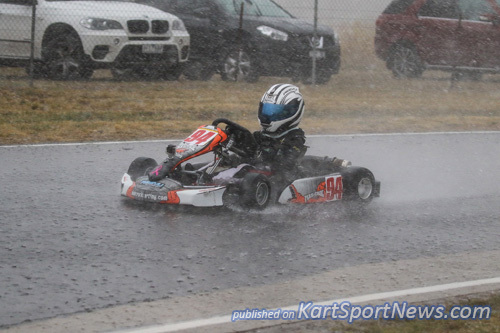 He then made up for it in the final by slicing through the big field in the slippery conditions to finish 2nd and Francis in 3rd. In 2016 Ben Holliday and Jesse Lacey were the ones to watch but in 2017 it seems like Tyce Hodge and Ryan Newborn are the new pair of speedsters. 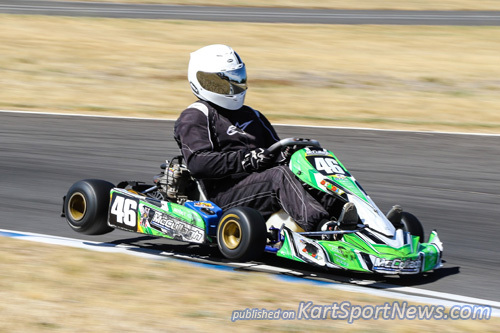 Hodge at one stage was in complete control starting from P1 and claiming the first. 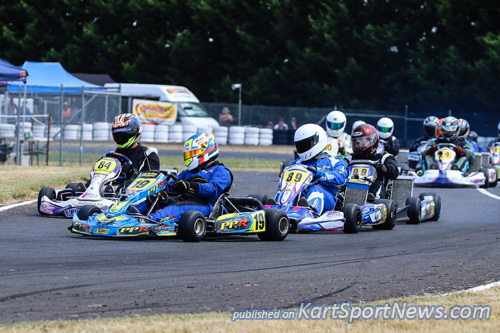 Ryan Newborn turned the tables in the prefinal ahead of Hodge and Bradley Axford who claimed a 3rd in the 1st heat. Leo Iannella and Cadel Ambrose showed glimpses of pace finishing in the top 5 along with Rusty Ponting. 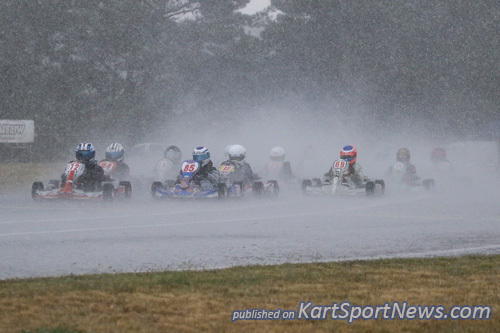 All the Cadet 9`s put on a great show in the heats and they became the first class first class out in truly wet conditions, with the rain coming down strong almost as soon as the race had started. A mix of wet and dry tyres was chosen, with several on slicks not venturing past the first corner. 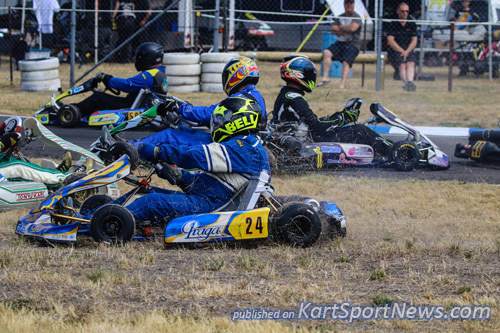 With 5 laps down out of 15 the heavens opened the door so wide that the Cadets were literally getting blown off the track. As more rain fell the track for them was becoming undrivable and they were exiting the island in quick succession which brought out the red flag as it was almost impossible to see. With very few rain covers being remembered on the out grid, many also came in with an airbox full of water. *NOTE: Cadet 9 final result is provisional. 12 would start the day with Michael Angwin taking the pole from Patrick Garner and Braydon McKinnon, The first heat saw Angwin only lead for a short time as Marc Tune and Andrew Harvey decided to pile on the pressure and make moves and show their intentions early by taking the first heat in that order with Angwin in 3rd. Real estate was a valuable commodity in the 2nd heat as the field crossed the start line, drivers were making bids for position when nearly half the field left the island and ploughed into the tyres with such force that the fence received some alterations and subsequently the red flag came out. 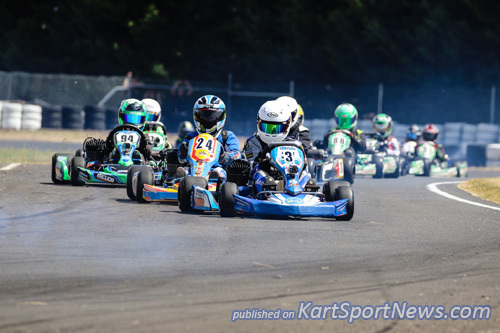 After the confusion and clearing of the karts the drivers left were restarted but this time Angwin asserted his dominance to take the 2nd heat with Tune and Harvey following. This class didn’t get to run their final so based on the final grid positions is the podium places. TAG 125 Restricted Medium replaced the heavy version this year and 20 entrants took to Haddon raceway but the top 2, Billy Westerveld and Luke Mason were separated by just over a 10th of a sec in qualifying. As for the racing Mason was capable of taking it to Westerveld but Billy had other ideas and kept a clean set of wheels in both heats. Matthew DeStefano picked up the pace to put Mason under pressure and this would pay off taking 2nd in the pre final. Phillip Zentai showed glimpses of speed to hussle with Mason and DeStefano but could only manage 4th twice. This class didn’t get to complete their final. Luke Mason and Matthew DeStefano were equal on points from the heats, with Mason taking the 2nd due to a 0.196 second advantage in qualifying. Excitement plus with 18 showing up to greet the starter and it was Jai Stephenson leading the field from Ryan Morgan. The first heat would tell the tale and set the scene as a group of 5-6 battled nose to tail for the top step. Further back another group of 7 were dicing with the same level of fierceness. 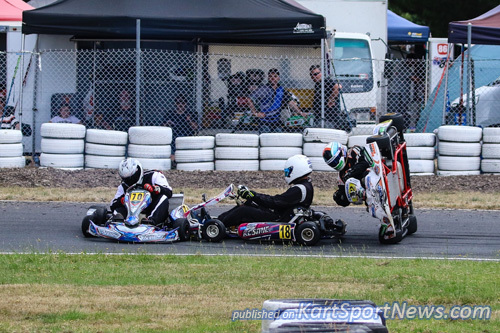 This was particularly hard to commentate on as the action was happening at both ends of the track. In race 1 Joel Johnson found pace going into the esses only to find the grassy route and slide out of control but fortunately stopping before threading the needle of the train on track, he rejoined to finish in 5th. The 2nd race was a precursor to what would have been an electric final with the top spots changing on a regular basis that provide spectators with (OOH) moments with Morgan and Stephenson going for a roller coaster ride but hanging on to 4rd and 2nd while at the other end young Callum Fry would exit stage right in an extreme hurry straight up the in grid lane to the weigh shed due to battling for position as he was leading the following bunch which ended his run for the weekend. This class didn’t get to run their final. 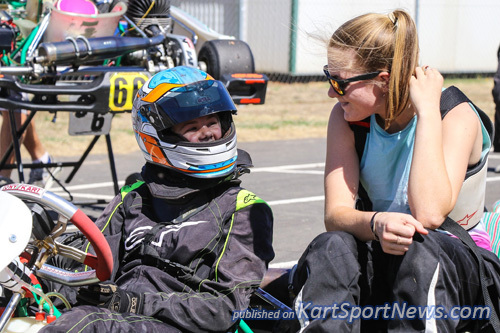 Nikki Watson got straight down to business after moving up from juniors and claimed the opening pole. But this was a very tight affair in qualifying with a hint of some good racing to come. 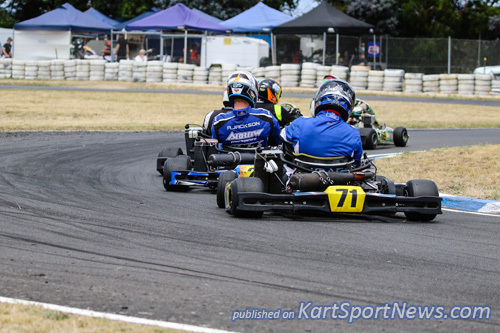 Race 1 as soon as the green was dropped Watson was gone in a masterful display the young gun from SA decimated the field leaving them wondering what to do to catch the fast young lady. 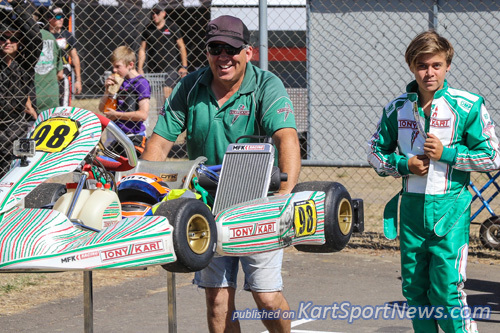 The 2nd heat brought the field closer and now Watson was under pressure from another Young SA lady;Tayla Heath put in a good effort to stay with Watson until Jack Bell split the SA duo and going on to catch Watson in a thriller that would have been an epic final. 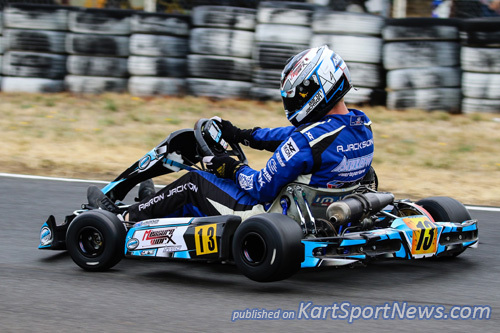 Hayden Jericho found his speed but just wouldn’t quite get to use it and come unstuck at T1. This class didn’t get to run their final. Bryce Woollard had very few laps on track, getting to the track as a very late entry Saturday night, but had no problem getting up to pace to claim 3rd. 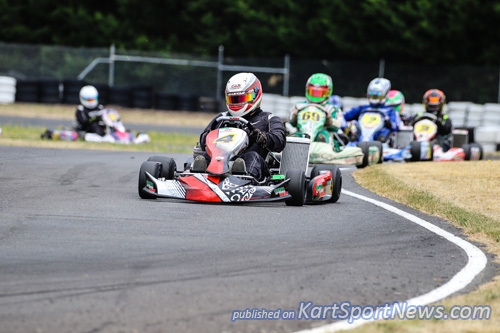 Remo Luciani was in complete control of the class from go to whoa. Aaron Jackson briefly made the old master look but places rarely changed throughout the heats. 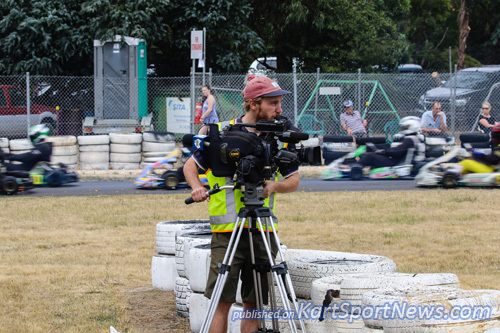 This was sort of good only for the commentator cause the lights were at one end and the mediums were at the other and with so much action in the lights the mediums rarely got a mention until the last lap. This class didn’t get to run their final. 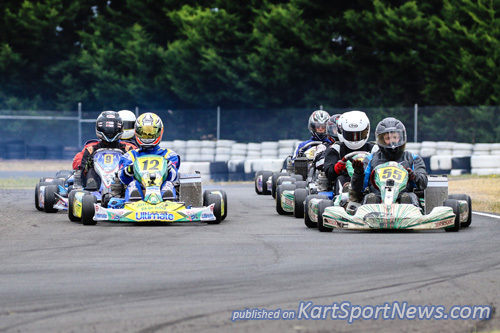 This class proved to be very entertaining with 5 drivers going toe to toe in the heats. 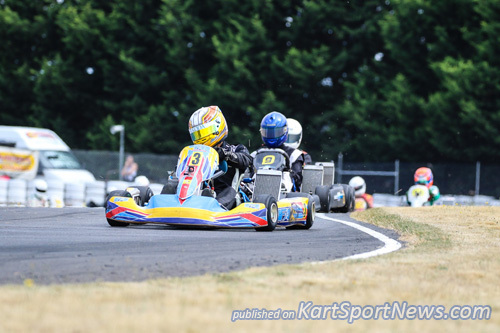 Jordan Malcolm steering his way to take both heats followed by Daniel Hookway who kept Malcom honest. Maximus Fahey and Jack Owen weren’t far of the mark until they started dicing allowing the front 3 to skip away. 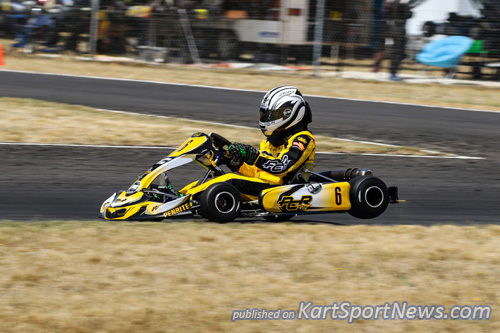 Aaron Oliver had great pace through the esses but lacked the out right speed to challenge for the lead but this made for interesting racing in the slow part of the track as he did manage to steal 2nd place but only briefly from Hookway and this allowed Malcom to run away with the win in heat 2. This class didn’t get to do their final. Welcome to the Harper / Domaschenz show, the only way to describe these two as they left the field in their wake to decide the minor placings. Harper lead the entire journey with Matthew so close you couldn’t get a piece of paper between them. 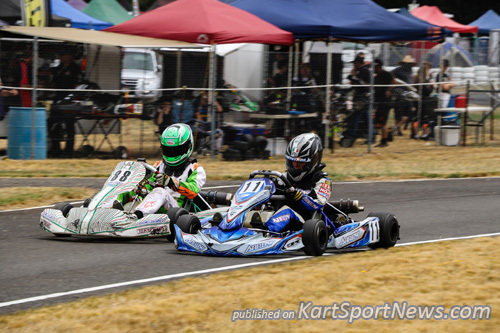 It looked like Matthew was just playing the waiting game and was going to pounce on the last lap last corner. Harper drove and defended with a maturity rarely seen at this level to be in command leaving Matthew questioning what might have been. While that was proceeding Isaac Woodhouse and Jaxson Johnston Brocklan Parker Michael Tarbotton Nathan Emmins were locked in battle right to the end. Isaac would have needed a telescopic sight to see Harper and Domaschenz but nether the less all the cadets put on a great show for the spectators alike. This class didn’t get to run their final. 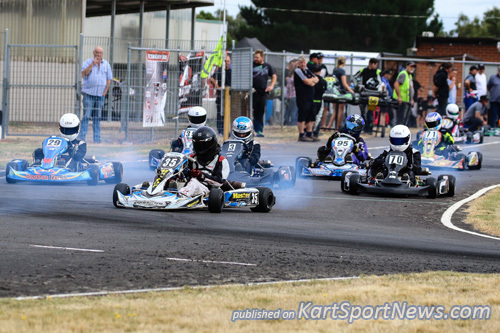 Gerry Westerveld showed he`d lost nothing over the break with a dominant performance in qualifying and the heats, leaving the fight up to a returning Corey McCullagh and Andrew Sotiropoulos. Meanwhile lurking behind the trio trying to make his presence felt was Matthew Ferrari. A raging battle was on between the 3 as Ferrari made up positions only to lose them again to Sotiropoulos. It was clean racing in the lights which would have been a great battle in their final had they been able to run it. In the end Gerry was to good streaking the field by 20 – 30 meters in the 2nd heat.